We offer a discount up to 25%! - We supply our Paracord in a bundle, custom length spool and standard size spool. Coreless Paracord 650 is perfect for use as cable sleeve when building drones and custom computers. Flat Paracord is a great solution for wrapping a bundle of cables, so that they are well protected. This coreless cord can also be used to make bracelets and keychains. Coreless Paracord gives a firm grip on knife handles, walking sticks and canoe paddles. Fill in the desired number of meters, and we will deliver the Paracord in a bundle or on a custom length spool. The price depends on the amount of meters you order. 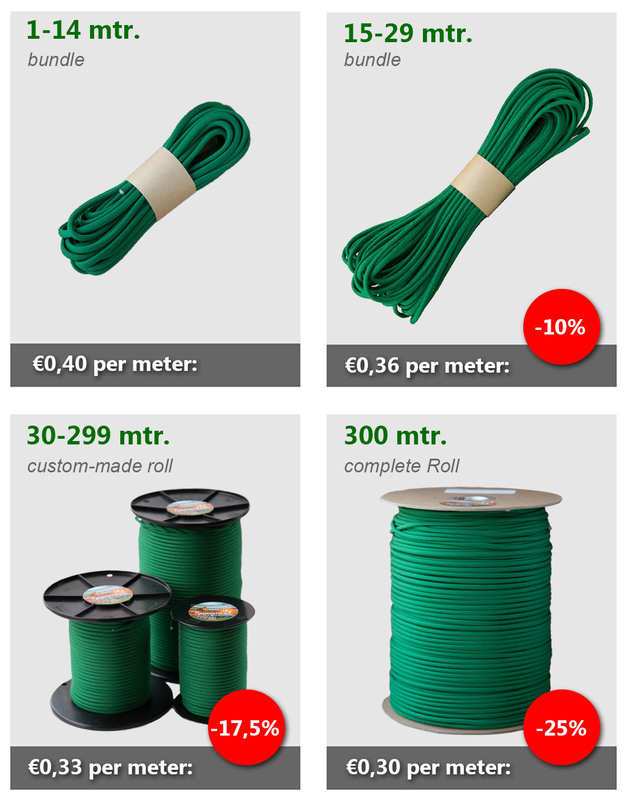 You'll receive the highest discount (25%) on a standard spool of 300 meters. If you would like this discount, type '300' in the number of meters field.